The people who lived in the “Byzantine Empire” never knew nor used the word “Byzantine.” They knew themselves to be Romans, nothing more and absolutely nothing less. By transferring the Imperial capital from Rome on the Tiber to the New Rome on Bosphorus, dubbed Constantinople, the Emperor Constantine I had transferred the actual identity of Rome to the new location. Long before Constantine I, the idea of “Rome” had become dissociated from the Eternal City on the Tiber. For a Roman meant a Roman citizen, wherever he lived. 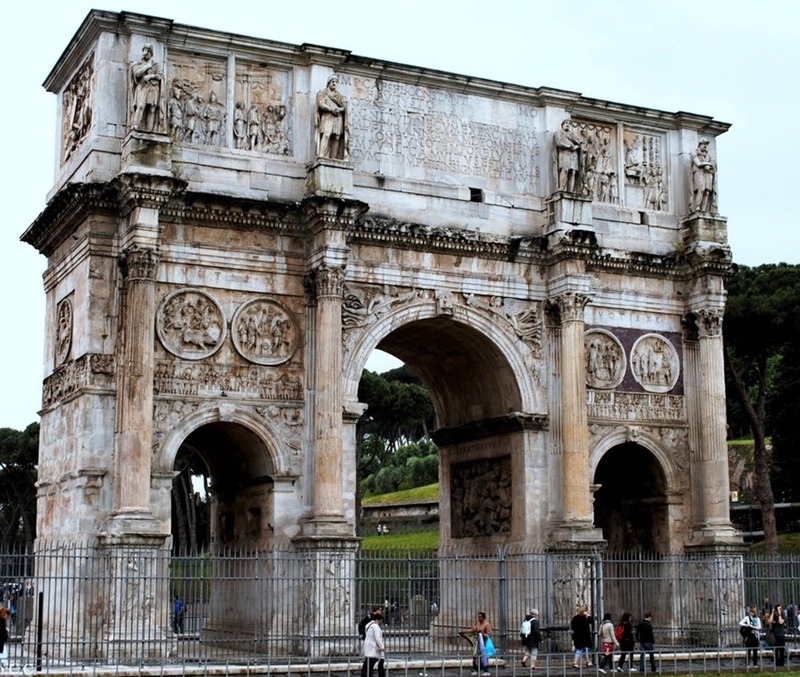 Before the Imperial period, in 89 BC, a Roman law had granted Roman citizenship to people throughout Italy. Afterwards, citizenship became extended to an increasing number of people in different parts of the Empire. In 212, Emperor Caracalla declared all free persons in the Empire to be Roman citizens, entitled to call themselves Roman, not merely subject to the Romans. 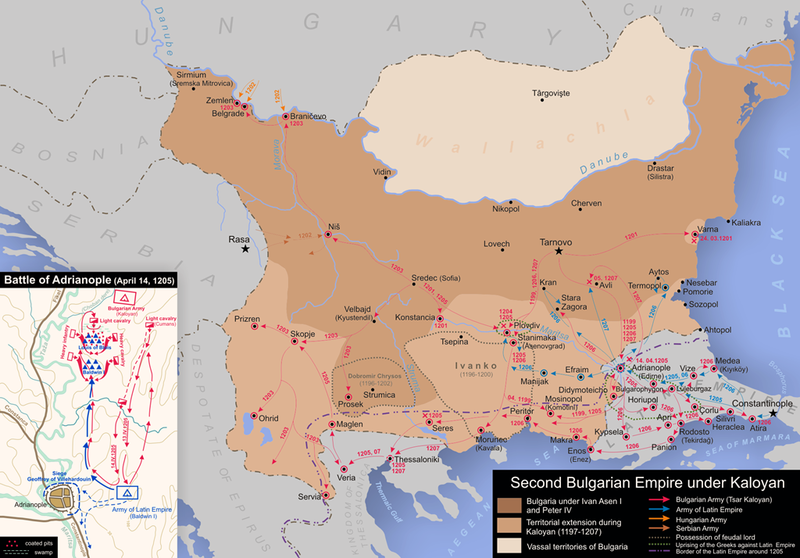 Within a few decades, people begin to refer to the entire Empire less often [in Latin] as “Imperium Romanorum” [Domain of the Romans] and more often as “Romania” [Romanland]. The Empire at Constantinople should not be called the “Byzantine Empire” at all, the very name “Byzantine Empire” is, in fact, an insult. 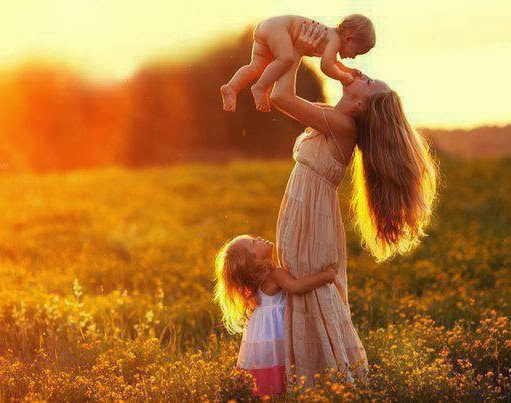 Greek-speaking Byzantines adopted the Slavic name Vlach (originally Germanic) for the Pastoral Care of Romance-speakers of the Balkan Peninsula and beyond. We have reason to believe that in their own language the Vlachs called themselves Romans or Ruman. In his De Administrando Imperio, written in the 10th century, Byzantine emperor Constantine Porphyrogenitos describes the Latin-speaking Romanoi as distinct from the Greek-speaking Romaioi. By the 8th century Greek had replaced Latin as the language of the administration of the empire. Even so, the Byzantines considered themselves the continuators of the original Roman Empire, and they called their empire Romania. The term Byzantine Empire did not even exist until some time after the fall of the Empire to the Ottomans in the 15th century. So why did the Byzantine Greeks adopt the term Vlach? One explanation is that they had lost contact during the Slavic migrations and especially during the existence of the First Bulgarian Empire, from the 9th to the 11th century. The Pope placed the Imperial crown on Charlemagne’s head at Christmas, 800. After his coronation, Charlemagne called himself “Carolus Augustus Imperator Romanorum gubernans Imperium” [Charles Augustus, Emperor governing the Domains of the Romans]. The authorities at Constantinople did not wish to recognize the claims of the Frankish upstart in the West, although political reality forced a compromise on the part of Emperor Michael I [811-813]. Michael began to call himself [Michael, Roman Emperor]. Before this change, no Roman Emperor had ever used the word “Roman” in his official titles: the Emperor was simply the “Imperator Caesar Augustus.” Diplomatists at Constantinople would soon argue that “Basileus Romaion” and “Basileus” were two different things. In that view, “Basileus Romaion” stood as a superior and unique title reserved for the ruler at Constantinople. According to this clever theory, Michael had really conceded Charlemagne nothing except a royal title, “Basileus” in the sense of “King.” equivalent to the Latin “Rex.” No wonder “Byzantine” means duplicitous. Not until the time of Emperor Otto III [983-1002] did Western Emperors consistently start calling themselves “Imperator Romanorum” [Roman Emperor] in direct challenge to the “Basileus Romaion” of Constantinople. Centuries later, the “Franks” of the Fourth Crusade stormed Constantinople in 1204. In the subsequent Imperial hiatus, these adventurers, largely French, elected their own Emperor and established their own Frankish or Latin Empire. The Frankish or Latin Imperial title was “Imperator Romaniae” [Emperor of Romania]. The “Imperator Romaniae” was something different from the “Imperator Romanorum.” In Western Europe, the title the “Imperator Romanorum” belonged to the German successors of Charlemagne and Otto III when they were crowned by the Pope in Rome. Until 1800, most Europeans, particularly Catholics, spoke of the “Sacrum Romanorum Imperium” [Holy Roman Empire] as a serious and important enterprise. Nonetheless, Western Europeans did not call themselves Romans or refer to their homeland as Romania. These words were conceded, albeit grudgingly, to Constantinople. In the eleventh century, a branch of the Seljuk Turks established a Sultanate in Asia Minor, after the Battle of Manzikert  in which Emperor Romanus IV fell into the hands of the Turks as a prisoner. This Turkish state in Asia Minor was called “Rum” from Rome (and Romanus IV). The later Ottoman Turks adopted the term “Rumelia” to designate the portions of the Balkan Peninsula that they acquired from the Romaioi in the fourteenth century. “Rumelia” was a dimunitive word. If Anatolia was Rome [Rum], than the European territories were Lesser Rome [Rumelia]. After Wallachia and Moldavia coalesced into a single entity in 1859, the name “Romania” was selected in 1862 to describe the combined state. At the time, Romanian unity and independence required the support of France under Emperor Napoleon III [1852-1870]. The “Latin connection” with France aided the Romanian cause by inspiring French interest in their “sister nation” of Romania. For more than a millennium, the state that we call, inaccurately, the Byzantine Empire was “Romania.” Modern Greeks call themselves “Hellenes,” like the ancient Greeks did. The switch from “Romaioi” back to “Hellene,” like the switch from “Vlach” to “Romanian,” came from the politics of nationalism in modern times. Greeks needed Western European help to become independent in the early nineteenth century. The Greeks were not likely to attract assistance if the Western peoples thought of Greeks as Byzantines. However, if the Greeks were imagined as the children of Plato and Pericles, then the sympathies of educated Westerners, steeped in the Classical tradition, would be with Greece. In the Greek Revolution of 1832, the “Philhellenic” [Greek loving] sympathies of Britain and other European governments were deeply engaged. Intervention on behalf of Greek independence proved decisive. The name of “Hellene” was revived in order to create a national image which rejected the “Byzantine” past. 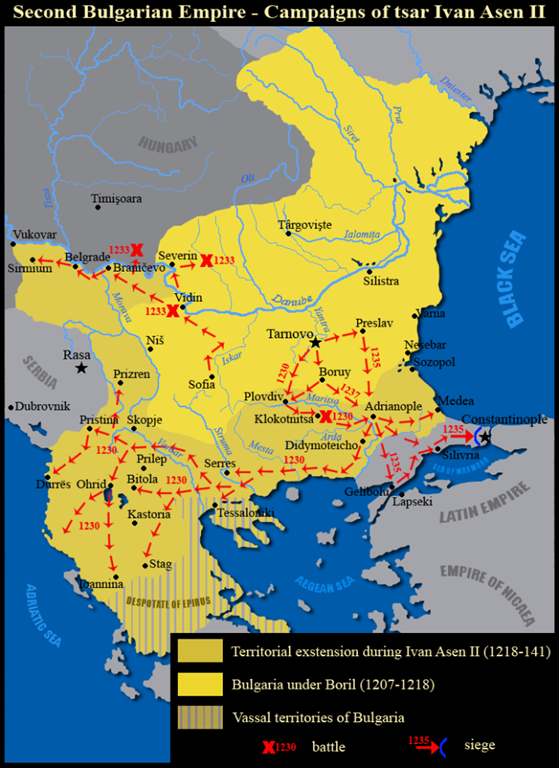 wiki > Imperiul Roman de Răsărit Denumirea oficială era Ρωμανία, Romanía sau Βασιλεία Pωμαίων (Basileía Romaíon), Imperiul Roman. Heraclius I a elenizat imperiul aproximativ pe la 640, prin adoptarea limbii grecești ca limbă oficială, dar majoritatea populației din zona europeană a imperiului, cu excepția grecilor, au continuat să vorbească latina populară până la apariția limbilor populațiilor migratoare (slavi și bulgari). Termenul Imperiul Bizantin a fost inventat în 1557, la aproximativ un secol după căderea Constantinopolului, de către istoricul german Hieronymus Wolf. Bizantinii se numeau pe ei înșiși Ρωμαίοι – Romaioi, prin care se deosebeau de vechii Έλληνες – Elini, care, în Evul mediu, însemna „greci antici păgâni”. Sub stăpânirea otomană, grecii au continuat să se definească ca Ρωμαίοι (Romaioi, în turcește, Rum), apoi treptat, odată cu dezvoltarea naționalismelor moderne și cu regăsirea istoriei antice, din ce în ce mai frecvent, Έλληνες Elines. Revista AS >> Imparatii daci ai Romei - Dacia – abandonata sau eliberata? Regalian, stranepotul lui Decebal este cel dintai dac care a urcat in aceasta ierarhie. Poate fi doar o genealogie imaginara, ceea ce insa nu se poate pune la indoiala este originea dacica a lui Regalian. In anul 260, in vreme ce pe tronul Romei se afla Gallienus, dacul Regalian, general cu talent de strateg, se afla in fruntea trupelor din zona Dunarii, din Pannonia si Moesia. Nu mult dupa anul 260, el pune la cale o rebeliune, in urma careia este proclamat imparat de catre trupele sale. Figura lui Regalian este deosebit de importanta in istoria provinciei Dacia, deoarece coincide cu un moment-cheie: abandonarea provinciei de catre Gallienus. Desi Aurelian este considerat autorul retragerii trupelor si administratiei romane din Dacia, totusi, izvoarele istorice si arheologice ne confirma faptul ca provincia Dacia a fost abandonata mai devreme, in vremea lui Gallienus, iar Aurelian nu a facut decat sa consemneze in acte un fapt deja consumat si pe care oficialitatile multa vreme nu au avut curajul sa-l recunoasca.Scrierile vechi ne informeaza ca “Dacia a fost pierduta” in vremea adversarului lui Regalian, iar arheologia ne arata ca tot in vremea acestui imparat au incetat inscriptiile romane din Dacia, precum si baterea de monede. Tot in vremea lui Gallienus a trait si Marcus Acilius Aureolus, dac dintr-o familie de ciobani, el insusi pastor in tinerete. A fost proclamat suveran la Mediolanum de catre armatele sale, in anul 268. Totul se petrecea in plina criza politica a imperiului, celebra criza a secolului al II-lea, cand s-au succedat la tronul Romei o multime de imparati, mai toti provinciali, mai adesea sprijiniti de armata. Gallienus a pornit impotriva celui de-al doilea dac autoproclamat imparat, Aureolus, care i-a cerut ajutor lui Postumus. Acesta insa l-a refuzat, tradand prietenia care ii lega. Totusi, cel care a murit in asediul de la Mediolanum a fost Gallienus, iar Aureolus a reusit sa-si pastreze titlul, pana in vremea lui Aurelian, dar a fost tradat si ucis, ca si Regalian, de propriii lui soldati. Galerius Maximianus (292-311) i-a urmat la domnie lui Diocletian, al carui protejat a fost. S-a nascut intr-un sat din apropiere de Serdica (Sofia), dintr-o mama daca, venita din nordul Dunarii, din Dacia Traiana. Se crede ca, dupa numele sau romanizat, Romula, mama sa ar fi venit de undeva din Oltenia, din Dacia Malvensis, poate chiar din orasul Romula (astazi Resca, jud. Olt). Lactantiu, scriitorul crestin care ne confirma originea dacica a imparatului Galeriu, ne mai da cateva informatii uluitoare despre acest dac ajuns imparat. In primul rand, a vrut sa supuna la obligatia platii impozitelor Roma si intreaga Italie, drept razbunare pentru umilirea dacilor de catre Traian, care le-a impus tribut dacilor. In al doilea rand, a vrut sa schimbe numele Imperiului roman in Imperiul dacic. Inainte de a muri, imparatul s-a retras in satul sau natal, care a fost numit Romulianum, dupa numele mamei sale. Dacismul lui Galerius este incontestabil, la fel si adversitatea sa fata de romani si de numele de “roman”, declarata deschis de imparat. Nu ar fi exclus ca seria lunga de documente ce relatau cucerirea Daciei, toate disparute astazi, sa fi fost cenzurate sau distruse in vremea lui Galeriu sau a altor imparati de mai tarziu, care au incercat sa apere astfel memoria dacilor. Daia si Licinius. Maximinus Daia (sau Daza) era nepotul imparatului Galeriu. S-a nascut in Dacia Aureliana, la sud de Dunare, avand-o ca mama pe sora imparatului. A ajuns sa fie adoptat de unchiul sau, dar chiar si dupa adoptie, a tinut sa-si pastreze numele dacic. In schimb, despre Licinius, izvoarele spun ca se tragea dintr-o familie de tarani daci din Moesia Superior. S-a nascut in anul 265 si a ajuns prieten foarte bun cu Galeriu. Imparatul Galeriu i-a conferit lui Licinius titlul de “Augustus” in vestul imperiului, in anul 308, in timp ce Daia, nepotul imparatului, si Constantin (si acesta de origine moeso-dacica) au fost numiti “fiii augustilor”. In felul acesta, toti cei patru suverani care formau tetrarhia (forma de conducere cu patru imparati, doi de rang superior si doi de rang mai mic), erau de origine dacica. Cu acesti patru imparati de origine dacica, ce au condus imperiul simultan, a inceput o noua epoca in istoria Imperiului roman. Dar cel mai mare imparat roman de origine dacica este Constantin, primul imparat crestin din istorie. S-a nascut la sud de Dunare, la Naissus, in Serbia de astazi, pe atunci provincia Moesia Superior. Tatal sau, imparatul Constantius Chlorus, era tot din Naissus. In anul 325, in vremea conciliului de la Niceea, la Naissus este atestat un episcop care isi spune “Dacus”. Prezenta dacilor la sudul Dunarii, atat inainte de cucerirea Daciei cat si dupa aceea, este incontestabila. Deci, Constantin era, mai exact, un moeso-dac. Desi nu stim in ce fel dacismul sau i-a influentat actiunile, stim sigur un lucru: el este cel care, la doar doua secole dupa cucerirea Daciei, spoliaza monumentele din splendidul for al lui Traian. Marea friza de piatra a lui Traian, masurand peste 30 de metri (dupa altii mult mai mult) si fiind a treia ca marime din intreaga antichitate, este sparta in bucati de Constantin. Patru bucati sunt incastrate in arcul sau de triumf de la Roma, dupa ce figura lui Traian este stearsa din reprezentarile reliefurilor. Mai mult, opt din grandioasele statui de daci, inalte de trei metri, care impodobeau forul lui Traian, sunt scoase de la locul lor si urcate pe Arcul imparatului Constantin. Ce logica sa aiba dislocarea unor statui colosale de daci si plasarea lor pe un monument al unui imparat roman, daca nu faptul ca acesta era nascut tot in tara dacilor? Cu siguranta, Constantin avea o mare pretuire pentru stramosii sai. Iulian Apostatul ne povesteste ca, dupa ce a vazut pentru prima data forul lui Traian, Constantin a fost abatut timp de mai multe zile, spunand ca el nu va avea niciodata un for atat de grandios. Dar nu este suficienta aceasta explicatie. Oricat de mare ar fi fost lipsa de materiale si de artisti talentati, nici un imparat nu ar fi indraznit sa distruga monumentele unui predecesor, daca acesta era pretuit, memoria sa era onorata si facea parte din galeria sacra a parintilor Romei. Gestul atat de neobisnuit si de socant al plasarii celor opt statui de daci pe Arcul de triumf al lui Constantin isi gaseste in acest fel o explicatie. Statuile de pe arc simbolizeaza obarsia dacica, mandra si iubitoare de libertate, a imparatului. Din aceasta perspectiva, nu ar fi deloc absurd sa ne gandim ca scrierea de capatai a lui Traian despre cucerirea Daciei a disparut, ca si celelalte scrieri ce relateaza acest eveniment dramatic din istoria dacilor, din ordinul lui Constantin. Daca Galerius nu a contribuit la disparitia acestor scrieri, se poate sa o fi facut Constantin. Constantin cel Mare este cel care a mutat capitala imperiului la Byzantion, numit dupa moartea sa Constantinopol. Romania – Imperiul Roman cu capitala la Bizanţ Constantin cel Mare s-a născut la Niş şi a crescut în complexul mediu al traco-romanilor şi protoromânilor aflaţi la putere în Imperiu. Drumul său către Hristos a fost, ca la aproape toţi oamenii, un drum lung şi greu în care ispitele au fost multe. El a fost multă vreme influenţat de religia tatălui său – pe care sigur, dincolo de nedreptatea făcută mamei sale, l-a iubit şi admirat. Dar în final nu doar a acceptat creştinismul, ci s-a făcut şi propovăduitor al acestuia în tot Imperiul, fara sa fie persecutor al altor religii. Să nu uităm că mult admirata biserică Sf. Petru din Roma i se datorează, ca şi cea din Lateran, ca şi Biserica Sfântului Mormânt (a Învierii) din Ierusalim, cea a Naşterii Domnului din Bethleem şi cea a Înălţării de pe Muntele Măslinilor. Tot el a ridicat şi alte locaşuri sfinte la Cirta (Numidia), Nicomedia şi Antiohia şi le-a înzestrat cu mari averi. Alte biserici deosebit de frumoase a ridicat în Bizanţ, cea mai vestită fiind biserica Sfinţilor Apostoli3. Dar ceea ce conferă domniei sale o semnificaţie care este superioară pentru noi, Românii, celei general creştine, este acel act uimitor al mutării capitalei de la Roma la Bizanţul tracic. Mutarea capitalei are o semnificaţie aparte. Dar motivaţiile lui Constantin cel Mare au fost mai profunde decât un simplu calcul militar sau administrativ. Roma era păgână. Constantin cel Mare era creştin. Avea nevoie de o Capitală creştină, nu de una păgână. Centrul de greutate al creştinismului de limba latină se afla în acea vreme în ceea ce mai târziu s-a numit Dioceza Traciei. Din acest moment apare Romania, Terra Romanorum. Din acest moment Vechea Romă, ostilă şi străină, este înlocuită de Noua Romă, simbol al tuturor aspiraţiilor religioase, sociale şi economice ale Românilor. Trebuie subliniat că a fost iniţial un oraş mai mult românesc decât latin – păgânesc – sau grecesc, iar efectul său asupra spiritualităţii româneşti a fost profund. Deşi se consideră de obicei că epoca Romaniei / Imperiului Roman de Răsărit începe cu anul 395 considerăm că este nepotrivit ca o excepţie – unitatea Apusului şi Răsăritului sub Teodosie I cel Mare – să fie tratată ca regulă. Bazele divizării Imperiului fuseseră puse încă în perioada împăraţilor păgâni traco-iliri, iar Sfântul Constantin cel Mare a consfinţit această situaţie încă în timpul domniei sale, atât prin mutarea capitalei cât şi prin felul în care şi-a asociat fiii la domnie. Mai este cazul să spunem că divizarea etnică dintre latinii apuseni şi Românii din zona Dunării şi Asiei Mici a favorizat această separaţie. Şi pentru că momentul în care Străromânii ajung la putere este momentul victoriei Bisericii, 313, credem că acesta, ori cel mai târziu 325, sunt anii de la care putem vorbi cu adevărat de apariţia Imperiului Roman de Răsărit (Romaniei). De-a lungul Dunării, din Noricum în Sciţia, se găseau numeroase centre episcopale. O listă a episcopilor din Panonia Inferior, Moesia Superior, cele două Dacii – Ripensis şi Mediterranea – Dardania, Moesia Inferior şi Sciţia Mică a fost realizată în 1975 de părintele Mircea Păcurariu9. Completată de listele pentru Iliria, Panonia Superior, Noricum, Epir, Macedonia, Thracia, Chersonez etc., ar putea ajuta la formarea unei imagini nu doar asupra unităţii Românilor sud şi nord dunăreni, ci şi asupra vechii istorii bisericeşti a Neamului Românesc. Întrebarea care se pune este: în ce măsură exista o unitate a Românilor din zonele aflate sub administraţie romană şi cei din zonele aflate sub influenţa Imperiului? Într-adevăr, până când, popoarele alogene balcanice, de la neogreci la croaţi, au început a-şi dezvolta cultura naţională şi a o impune şi Românilor de pe teritoriul lor, limba română avea un aspect deosebit de unitar10. Or, explicarea unităţii lingvistice a unui neam atât de întins a creat multe dileme şi polemici. Poporul român s-a format atât în Romania balcanică, din Noricum în Bitinia, cât şi în Romania nordică, de la izvoarele Oderului la ţărmurile Azovului; singura diferenţă este că Românii din nord, inferiori atunci celor sudici atât pe plan economic şi social cât şi organizatoric, militar etc, au fost mai mult influenţaţi decât au influenţat în raporturile lor cu Românii sudici. Este bine să ne reorganizăm viziunea asupra începuturilor Neamului nostru, pentru a putea duce mai departe moştenirea şi misiunea. Țaratul (regatul) vlaho-bulgar a fost în egală măsură valah (aromânesc la sud de Dunăre și românesc la nord) și bulgar. Asta nu înseamnă că valahii (aromânii și românii) i-au cucerit pe bulgari sau că bulgarii au cucerit principatele dunărene, ci înseamnă că în cadrul acestui stat au conlocuit două populații, una romanofonă, celalată slavofonă, pe ansamblul teritoriului său, toponimia veche aratând o predominanță a slavilor la șes, și a romanicilor în zonele peri-montane, deluroase și mai păduroase; țărmurile aveau o populație preponderent grecească. Ulterior, despărțirea proto-românilor de către populațiile slave așezate printre ei, a creat cele patru grupuri lingvistice : daco-român, aromân, megleno-român și istro-român; daco-românii absorbind treptat slavii din nordul Dunării, în timp ce slavii au absorbit treptat majoritatea aromânilor, megleno-românilor și istro-românilor din sudul Dunării. Original article>> WHAT, IF ANYTHING, IS A BYZANTINE? by Clifton R. Fox Professor of History, Tomball College, Tomball, TX, USA. Revised 3/29/96. Introduction – By modern convention, the phrase “Byzantine Empire” refers to a political entity that once dominated the Mediterranean world. The city called Constantinople or [on today’s maps] Istanbul functioned as capital of the Empire. The “Byzantine Empire” originated with the founding of Constantinople in the fourth century AD on the site of the much older Greek colony of Byzantium. The Roman Emperor Constantine I [died 337] called the site New Rome or Constantinople. Constantine situated his capital in the new city named after himself. The successors of Constantine I lived in Constantinople without interruption until 1204. In 1204, Crusaders from Western Europe, diverted from the path to Jerusalem, captured and looted Constantinople. They held the city until 1261. The “Byzantines” restored the “Byzantine Empire” at Constantinople in 1261 after the “Franks” were expelled. In 1453, the Ottoman Turks stormed Constantinople. The “Byzantine Empire” ceased to exist. The role of the “Byzantine Empire” in European history is not sufficiently understood by the educated public of today. Constantinople stood at the economic, political and cultural heart of Europe from its founding until the wanton sacking of Constantinople by the Crusaders. The New Rome withstood the assault of many attackers, protecting all Europe against the flood of invasion. 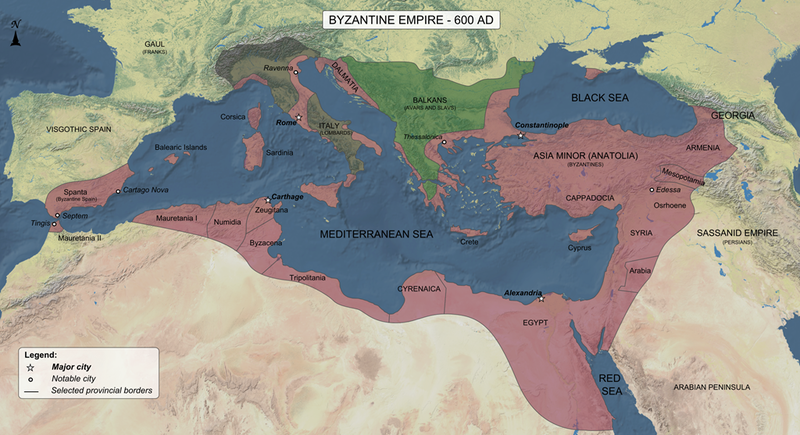 The “Byzantine Empire” flourished in the same era that found Western Europe ensnared by poverty and violence. One cannot omit the added fact that Constantinople yet remains the religious lodestar of Orthodox Christians: the predominant faith of Russia and other lands is rooted in the Byzantine experience. In our time, with recent changes in Russia, her Byzantine roots seem more relevant than ever to the present. In spite of its rich heritage and significant role, the achievements of Byzantine civilization have often been given short shrift and denigrated: the very name “Byzantine Empire” is, in fact, an insult. The phrase “Byzantine Empire” was coined and popularized by French scholars such as Montesquieu, an influential figure of eighteenth century intellectual life.. He was the same author whose seminal volume The Spirit Of The Laws did much to inspire the Founding Fathers of the United States in their writing of the American Constitution. Like other thinkers of his time, Montesquieu revered the ancient Greeks and Romans with immoderate enthusiasm as masters of politics and culture to be emulated. Following a Western European tradition that extended back to the early Middle Ages, Montesquieu regarded the Empire at Constantinople as corrupt and decadent. Although he wrote a long history of the Empire at Constantinople, Montesquieu could not bring himself to refer to the Empire at Constantinople with the noble names of “Greek” or “Roman.” From the obsolete name “Byzantium,” Montesquieu used the word “Byzantine.” The word “Byzantine” denoted the Empire and connoted its supposed characteristics: dishonesty, dissimulation and decadence. The English scholar Edward Gibbon in his Decline and Fall of the Roman Empire treated the Empire after the sixth century as an epic of unrelieved degradation and corruption. In the provinces close to Constantinople, where the Greek language predominated over the Latin of Old Rome, the idea of Roman citizenship and identity appealed to a broad segment of the population. Greek speaking citizens were proud to be Romans: in Latin, “Romani,” or, in Greek, “Romaioi.” The word “Romaioi” became descriptive of the Greek speaking population of the Empire. The old ethnic name applied to Greeks, “Hellene”, fell into disuse. In ancient times, of course, “Hellene” had meant Greek. Hellene meant Greek from the seventh century BC onward, if not earlier. Although Homer called Greeks by other names, Herodotus, Pericles, Plato and Alexander were all “Hellenes,” as were Greek speaking inhabitants of the Roman Empire in the first and second centuries AD. In the fourth century AD, as the Empire became Christianized, the term “Hellene” became redefined by common convention to include people who still worshipped the old gods and studied philosophy in hopes of resisting the new faith of Christianity. Emperor Julian II [361-363], an Emperor who tried to stop the Christian tide, described himself as a “Hellene.” By “Hellene,” Julian signified his combination of Neo-Platonic philosophy and worship of the Olympians. In the final years of the fourth century AD, Emperor Theodosius I [379-395] made Christianity the sole state religion after subduing the rebellion of an “Hellene” usurper, a westerner named Eugenius. After Theodosius’ critical decision, fewer and fewer people were willing to call themselves “Hellenes.” For centuries more, the word “Hellene” remained in bad repute, associated with outlawed religious ideas and disloyalty to the state. Greek speakers found the identity of “Romaioi” in place of “Hellene” to be a safe refuge in changing times. Greek speaking “Romaioi” inhabited the Empire until the its demise in the fifteenth century. The Empire at Constantinople should not be called the “Byzantine Empire” at all. If it requires a special name, we might better name the Empire at Constantinople with the title of the “Romaion Empire” from the Greek “Basileia Romaion” [Empire of the Romaioi]. Note that Greek letters “delta” and “tau” have entered the picture. The ambiguous “gamma” had been dropped from the abbreviation of “Augustus.” Nonetheless, the Latin titles remained. Roman forms were preserved, and still venerated. The word “Basileus” deserves a history of its own. In classical Greece, “Basileus” meant “King,” equivalent to the Latin “Rex.” From the time of Emperor Augustus [died 14 AD], Greeks called the Roman Emperor by the name “Basileus.” In the Latin language, of course, the Emperor was never called “Rex,” which was offensive to Roman Republican sensibilities: the Emperors were, in theory, chiefs of a Republican government. Roman Republicanism notwithstanding, the use of “Basileus” became standard among Greek speaking Romaioi to describe the Emperor. No way existed to translate the titles of “Imperator” or “Augustus” into Greek that did not sound contrived or ridiculous. The word “Autocrator” was coined to translate “Imperator.”;”Sebastos” stood as the parallel to “Augustus,” but neither “Autocrator” nor “Sebastos” acquired popular currency. Instead, the pretense developed that “Basileus” meant “Emperor” instead of “King.”. Romaioi commenced to use the Latin “Rex” to mean “King” in reference to non-Roman rulers of lesser rank than their own Emperor. The new usage of “Basileus” gained formal status much later. In the seventh century, Emperor Heraclius first employed “Basileus” in Greek language legal documents as his official title, but the word only replaced “Augustus” on the coinage in the Isaurian era [717-802]. The stunning event of Irene’s reign was the coronation at Old Rome of Frankish King Charlemagne [Carolus Rex Francorum] as Emperor in 800. Many authorities in the Latin speaking world had continued to recognize the Emperors at Constantinople as the legitimate Roman Emperors until Irene deposed her son in 797. In the eyes of the Latin West, the throne became vacant upon the removal of Constantine VI. Irene appeared objectionable on three counts: she was a woman, she had committed the heinous act of blinding her own son, and she adhered to Eastern religious practices , which the West rejected. Although Charlemagne, a Germanic tribesman [better to think of him as Karl instead of the Frenchified Charlemagne], was no Roman, he had brought unity to much of Europe. Why should not he, instead of some Greek women [Graeca], be Emperor? The Pope thought on these lines, and placed the Imperial crown on Charlemagne’s head at Christmas, 800. After his coronation, Charlemagne called himself “Carolus Augustus Imperator Romanorum gubernans Imperium” [Charles Augustus, Emperor governing the Domains of the Romans]. Before this change, no Roman Emperor had ever used the word “Roman” in his official titles: the Emperor was simply the “Imperator Caesar Augustus.” Diplomatists at Constantinople would soon argue that “Basileus Romaion” and “Basileus” were two different things. In that view, “Basileus Romaion” stood as a superior and unique title reserved for the ruler at Constantinople. According to this clever theory, Michael had really conceded Charlemagne nothing except a royal title, “Basileus” in the sense of “King.” equivalent to the Latin “Rex.” No wonder “Byzantine” means duplicitous. Not until the time of Emperor Otto III [983-1002] did Western Emperors consistently start calling themselves “Imperator Romanorum” [Roman Emperor] in direct challenge to the “Basileus Romaion” of Constantinople. Otto III took this step on the prompting of his mother Theopano, a princess from Constantinople who understood the subtleties of the problem. The “Basileus Romaion” of the time, Basil II [reigned 976-1025] was not a kinsman of Theopano, and she desired to elevate her son above the competition at Constantinople by calling Otto “Imperator Romanorum.” Of course, well-informed people in the West knew already that the best way to insult the authorities in Constantinople, if that was the goal, was to deny their identity as Romans. Call them “Graecus:” that translated to “Hellene,” that implied pagan as well as not Roman. In the West, the idea of “Imperator Romanorum” survived to describe the ranking Roman Catholic ruler until the nineteenth century. In 1508, the Pope authorized the “Rex Romanorum” to call himself “Imperator Romanorum Electus” [Elected Roman Emperor] without coronation at Rome. The last “Imperator Romanorum Electus” abdicated in 1806. Voltaire scoffed at the Holy Roman Empire in its senescence. The Holy Roman Empire was, Voltaire gibed, “…neither Holy, nor Roman, nor an Empire.” As in other matters, Voltaire ridiculed the things in which other people believed. Until the end, most Europeans, particularly Catholics, spoke of the “Sacrum Romanorum Imperium” [Holy Roman Empire] as a serious and important enterprise. Nonetheless, Western Europeans did not call themselves Romans or refer to their homeland as Romania. These words were conceded, albeit grudgingly, to Constantinople. Western Europeans were not the only despoilers of the Romaion Empire to refer to it by the name of Rome. In the eleventh century, a branch of the Seljuk Turks established a Sultanate in Asia Minor carved out of land in Asia Minor. The Sultanate’s territory had been cut from the Empire after the Battle of Manzikert  in which Emperor Romanus IV [reigned 1067-1071] fell into the hands of the Turks as a prisoner. This Turkish state in Asia Minor was called “Rum” from Rome. The Sultanate of Rum continued until after 1300 with its capital at Konya [Iconium]. The later Ottoman Turks adopted the term “Rumelia” to designate the portions of the Balkan Peninsula that they acquired from the Romaioi in the fourteenth century. “Rumelia” was a dimunitive word. If Anatolia was Rome [Rum], than the European territories were Lesser Rome [Rumelia]. The name “Rumelia” survived into the nineteenth century. After a Turkish defeat at the hands of Russia, the two combatant governments signed the Treaty of San Stefano . The Treaty included a provision to create a “Principality of Eastern Rumelia” under Russian “protection” on land now in Bulgaria. The attempt to create Eastern Rumelia never came to fruition. After diplomatic pressure from other powers, the Treaty of San Stefano underwent significant modification at the Congress of Berlin in 1878. Eastern Rumelia vanished before it came into proper existence. One might wonder why the name “Romania” became applied to the present nation called Romania. The association of the name “Romania” with the present nation “Romania” stems from the nineteenth century. In their first appearances in the historical record of the Middle Ages, the Romanians were called “Vlachs” by chroniclers from Hungary and Constantinople. 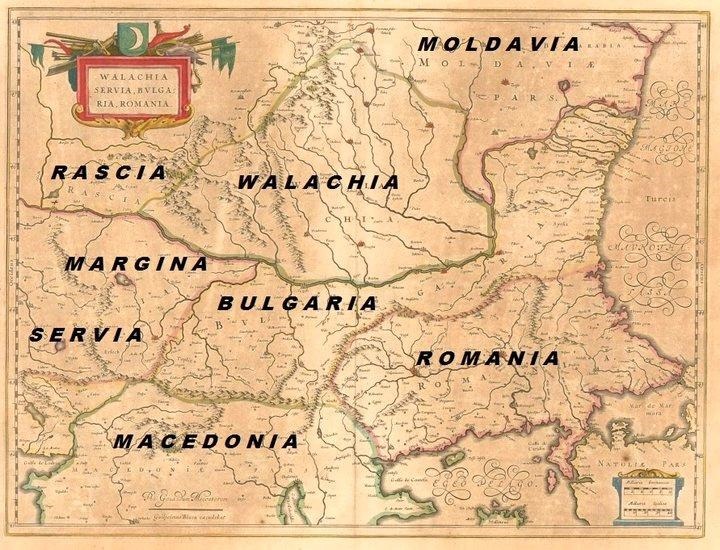 A principality called “Wallachia” emerged among the Vlachs before 1300. Separate Vlach principalities of Moldavia and Transylvania followed. Later, scholars realized that the Vlach language derived from Latin; Vlach was a sister language to Italian, French and Spanish. How did Latin speakers find their way to this remote part of Europe north of the Danube River? Scholars developed the theory that the Vlachs were descended from Roman colonists and Latinized natives who lived in the area north of the Danube River during the second and third centuries AD. In the period, the region constituted the Roman province of Dacia. Whether the theory is right or not, it became the basis of Romanian nationalist feeling in the nineteenth century. The idea of a Roman descent gave Vlachs new pride in themselves. After Wallachia and Moldavia coalesced into a single entity in 1859, the name “Romania” was selected in 1862 to describe the combined state. At the time, Romanian unity and independence required the support of France under Emperor Napoleon III [1852-1870]. The “Latin connection” with France aided the Romanian cause by inspiring French interest in their “sister nation” of Romania. Modern Greeks call themselves “Hellenes,” like the ancient Greeks did. The switch from “Romaioi” back to “Hellene,” like the switch from “Vlach” to “Romanian,” came from the politics of nationalism in modern times. Greeks needed Western European help to become independent in the early nineteenth century. The Greeks were not likely to attract assistance if the Western peoples thought of Greeks as Byzantines. However, if the Greeks were imagined as the children of Plato and Pericles, then the sympathies of educated Westerners, steeped in the Classical tradition, would be with Greece. In the Greek Revolution of 1832, the “Philhellenic” [Greek loving] sympathies of Britain and other European governments were deeply engaged. Intervention on behalf of Greek independence proved decisive. The name of “Hellene” was revived in order to create a national image which rejected the “Byzantine” past. Conclusion – The names by which things are called are important in shaping our interpretation of reality. People are often surprised to discover that historical labels which define the past are inventions of later scholarship and ideology, not parts of the past itself. Men and women of the Middle Ages did not know that they lived in the Middle Ages: people who lived in Classical Athens or Renaissance Italy suffered the same disability. The people of the “Byzantine Empire” had no idea that they were Byzantine. They regarded themselves as the authentic continuators of the Roman world: the Romans living in Romania.